Legend of Heavenly Sphere Shurato (Tenkū Senki Shurato) is a 1987 manga by Hiroshi Kawamoto. It was adapted into an anime by Tatsunoko Production and released in 1989. 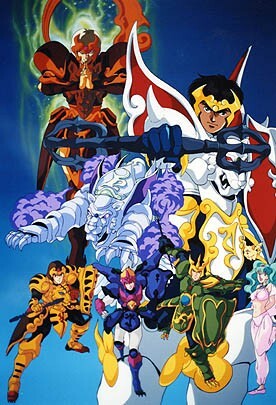 Due to the character design and the fact that the characters use a full-body armor very similar to those of Saint Seiya, the comparison was quickly made and the show was often accused of being a knock-off of the latter. Shurato is still notable to this day for being one of the rare Anime to date (with 3×3 Eyes) to rely entirely on Hindu mythology instead of Japanese and Chinese myths. Shurato Hidaka is a young martial arts champion about to compete for the title of Grand Champion of the Junior Tournament in Japan. Against him, his childhood best friend, Gai Kuroki who is also his greatest rival. As the final match is about to commence, a beam of light teleports them to an alternate reality known as Tenkuukai ("Heavenly World") where both discover they are the reincarnations of ancient spirits that are to protect the goddess Vishnu, along with her personal guard. Shurato later dons a shakti, a holy armour with a lion-motif that he owns as the King Lion Shurato (Shura-Oh Shurato). However, Gai makes a quick FaceHeel Turn and goes serving the Asurah leader Indra who had the goddess petrified and framed Shurato and his fellow guardian Hyuga for the deed. Shurato has a hard time confronting Gai since his new persona is completely different from the man he used to know. From now on, Shurato will have to accomplish his destiny and prove his innocence as well as free Visnu from her stone prison, with the help of the three only guards who believe in his innocence (Hyuga, Ryoma and Reiga) and Lakshu, a spirit priestess who falls in love with him. Action-Hogging Opening: The opening is packed with action, and features an absolutely gorgeous, detailed and fluid animation, considerably better than the one used in the series. Actor Allusion: Given the similarities between the anime and Saint Seiya, it's inevitable that some of the characters shared the same voice actors in the dubs. Most notable is Shurato himself, given that his Japanese and Brazilian Portuguese voice actors also voiced Saint Seiya characters (Scorpio Milo in the Japanese dub, Aries Mu and Unicorn Jabu in the Brazilian dub). Agent Peacock: Reiga, to the point that Shurato calls him "okama" when he's mad at him. The three "bad" Hachibushu (Dan, Kuya, Renge), since neither of them is oh so evil. They're all anti-villains who genuinely believe they're trying to punish those who are to blame for Vishnu's condition. Surprisingly, Indra gets one of these too. Animal Motifs: For most of the armored fighters. As Long as There is Evil: After Shiva's defeat, Lakshu learns that hatred, murder and suffering still existed on Earth despite the recent peace in Tenkuukai, which meant that black Sohma (evil) still existed in the land. Confused and aghast, Shurato attempts to discover the evil's source, only to learn that it is permeated in the entirety of Tenkuukai itself (i.e. trees, rocks, water, sky, people). The black Sohma overwhelms Shurato, who briefly becomes a new God of Destruction before regaining his sanity. He then realizes that evil is a part of nature itself and that the universe is in a constant, eternal struggle to find Balance Between Good and Evil. With this realization, Shurato and the spirit of Gai vow to someday become a true successor to Brahma and find true balance to bring an end to all suffering. Back from the Dead: After their defeat, the rogue guardians are resurrected by Vishnu herself. Barrier Maiden: Lakshu, unbeknownst to everyone. Big Bad: Indra. Later, Shiva, the Goddess of Destruction. Brainwashed and Crazy: Gai. Indra, apparently. Broken Bird: Renge. And her sister Sati. And Mina, in the OVA. By the Power of Grayskull! : "Om (Shakti name) sowaka!" Co-Dragons: The Rogue Guardians Hiba-Oh Kûya, Nara-Oh Renge and Hiba-Oh Dan. Dark Action Girl: Renge and Trylo. Darker and Edgier: The OVA deals with Mina's grief regarding Gai's disappearance, and has a generally quieter, more somber tone than the TV series. Distressed Damsel: Lakshu in rare occasions. Follow the Leader: The whole series is very similar to Saint Seiya in many parts, especially the armors and the characters. Giant Spider: A bunch show up in episode 4, and Shurato learns to control Sohma against them. Heart Is an Awesome Power: Lakshu, later in the series. The High Queen: Vishnu. Lakshu is supposed to become this, as Vishnu's successor. Hoist by His Own Petard: Dan. Human Popsicle: What eventually happens to Renge. "I Know You Are in There Somewhere" Fight: Attempted more than once by Shurato, who stubbornly believes Gai can be saved. Never really works, but he keeps trying despite the warnings of the others. Until almost the end... and it's still not enough to save his life. I Sense a Disturbance in the Force: All characters have Sohma which is a spiritual energy that can be sensed from a distance. Renge is Indra's Love Martyr, and she suffers a lot for it. Hyuga has a crush on her alongside his Ho Yay with Ryoma, and he's not happy to face her either. The local Ill Boy Marici is Renge's Unluckychildhood Friend. Only Child Syndrome: Averted for most of the cast. Almost everyone has brothers and sisters: Shurato himself has a little sister named Yumiko and Gai has an older sister named Mina. The Quest: For Shurato and Co., save Vishnu and clear Shurato's name. Raised by Grandparents: Shurato and Yumiko's grandfather helps their mom, Kiriko, to raise them. Sim Sim Salabim: Averted. Despite its evident Hindu motif, the series avoids using stereotypes linked to Indian people. Trapped in Another World: In the Tenkukai. A big problem for Renge and Dan. Renge feels this towards Indra, who saved her life and trained her; on the other hand, Dan has it for Vishnu, who treated him kindly. Indra obviously uses this to make them join him. Also to Hyuuga, who struggles at first with his beliefs and what he should do. He chooses believing in Vishnu and Shurato, so Indra becomes his Broken Pedestal. Unwitting Pawn: The rogue guards Renge, Dan and Kûya to Indra.